Ayya Anandabodhi first encountered the Buddha’s teachings in her early teens, igniting a deep interest in the Buddha’s Path of Awakening. She lived and trained as a nun in the Forest Tradition at Amaravati and Chithurst monasteries in England from 1992 until 2009, when she moved to the US to help establish Aloka Vihara, a training monastery for women. Her practice and teaching are guided by early Buddhist scriptures and through nature’s pure and immediate Dhamma. 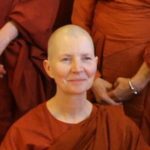 In 2011 she took full Bhikkhuni Ordination, joining the growing number of women who are reclaiming this path given by the Buddha. Santacitta Bhikkhuni was born in Austria and did her graduate studies in Cultural Anthropology, focusing on dance, theatre and ritual. She also worked in avant-garde dance theatre as a performer and costume designer. 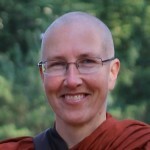 In 1988 she met Ajahn Buddhadasa in southern Thailand, who sparked her interest in Buddhist monastic life. 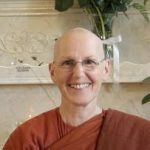 She has trained as a nun in both the East and West since 1993, primarily in the lineage of Ajahn Chah, and has practiced meditation for over 30 years. Since 2002, she has also received teachings in the lineage of Dilgo Khyentse Rinpoche. 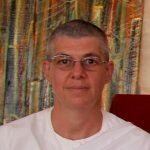 Santacitta Bhikkhuni co-founded Aloka Vihara Forest Monastery in 2009 and received Bhikkhuni Ordination in 2011. She is particularly interested in creating sanctuary close to nature and bringing wisdom traditions to the environmental movement. 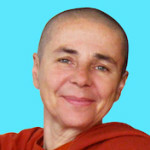 Ayya Ahimsa was born in Vancouver, BC in 1959. Her first career was as an orchestral clarinetist. Then, in order to be at home more when her two children were young, she taught preschool music. When her children were in elementary school she herself returned to university to obtain a Master’s in Speech-Language Pathology which enabled her to work with children with developmental differences. She began to meditate in 2006 and soon after knew she wanted to completely devote her life to training the mind and purifying the heart. 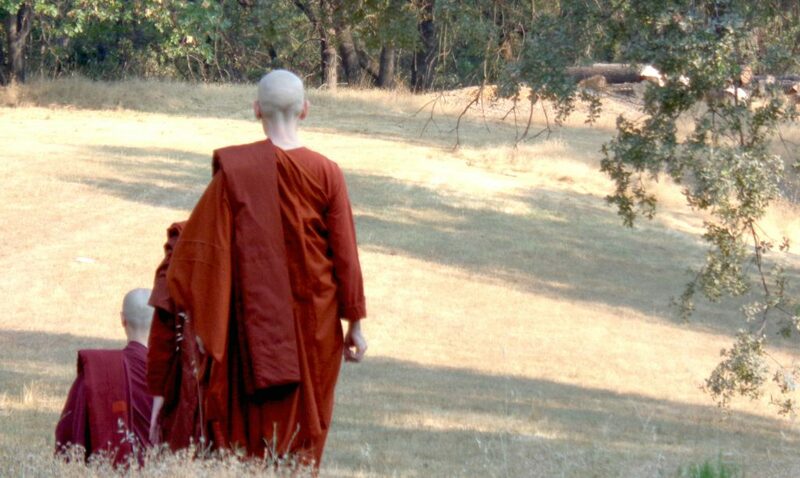 In 2008 she was first introduced to monasticism through visiting Ajahn Sona at Birken Forest Monastery. Due to aging parents and teenagers still at home she was not able to leave the householder life and go forth until 2012. Ayya Ahimsa took Anagarika Precepts in January 2012 and then Samaneri Precepts in September 2013 with Ayya Medhanandi at Sati Saraniya Hermitage near Perth, Ontario. In June 2016 she joined the nuns’ community at Aloka Vihara and was given Bhikkhuni Ordination in August 2017 with Ayya Gunasari Theri as her preceptor. Venerable Dhammadipa is a resident nun at Aloka Vihara Forest Monastery, having gone forth as a samaneri in the Theravada Forest Tradition in the West, in May 2018. Also a Dharma Heir in the Shunryu Suzuki lineage of Zen Buddhism, she serves as the Guiding Teacher of Ekan Zen Study Center, an online sangha which she co-founded in 2014. Dhammadipa took up the practice of Zen Buddhism in 1987, and was ordained a Zen nun in 2007. Her study and practice in the teachings of Early Buddhism evolved naturally from Zen practice. In addition to English, she teaches the Dhamma in Spanish, an expression of her Latin heritage. She is trained as an inter-faith chaplain, and has provided spiritual care in both hospital and hospice settings. Dhammadipa earned an MBA and worked in finance for many years before becoming a full-time practitioner. She greatly enjoys her relationship with her adult daughter, and sewing. Click here for a most recent post on Ven Dhammadipa’s blog. Carol became an Anagarika in October, 2018. She was born in California in 1970 to Brazilian parents and grew up in Brazil with Portuguese being her first language. At the age of 23, Carol left university in Brazil and came back to the US to try for a better life. Adjusting well she ended up staying. During the 6 years in the Navy and Army National Guard, Carol went back to college and earned a teaching certification in Health and Physical Education followed with a Master’s in Exercise Science. After teaching for 12 years in the public schools, including juvenile detention and coaching sports, she went on a 7-month sabbatical driving and camping cross country. Carol visited various monasteries in different traditions and earned a yoga certification during this time. Most recently, Carol taught for 4 years as an adjunct faculty at a community college teaching many subjects but focusing primarily on Yoga. Her first years as a Buddhist were spent mostly in the Tibetan tradition; Carol has been shifting her practice to the Theravada tradition for the past year and a half. Just over two years ago, after participating in the Exploring Monastic Life retreat at Sravasti Abbey, WA, Carol decided to become a monastic and chose Aloka Vihara to be her home. Carol appreciates sustainability, minimalism and the healing power of being in nature.